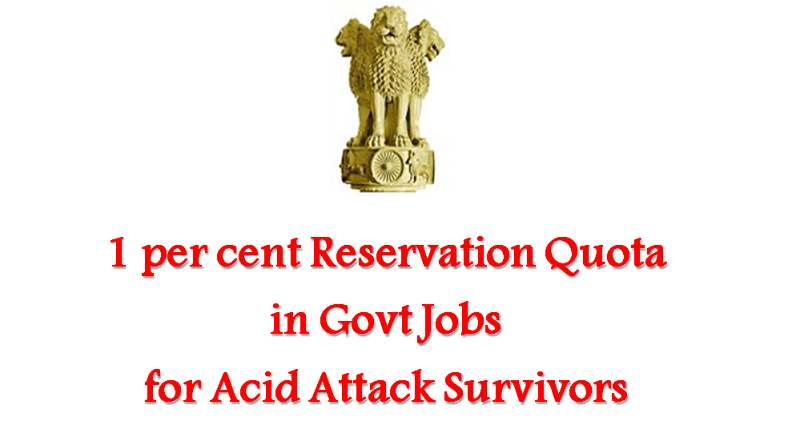 Soon acid attack survivors will be eligible for 1 per cent govt job quota. Acid attack victims are now part of the people with physical disability list under the new law of the Rights of Person with Disabilities Act, 2016. Soon survivors will be eligible for 1 per cent govt job quota. Acid attack victims are now part of the people with physical disability list under the new law of the Rights of Person with Disabilities Act, 2016. Minister for Women and Child Development stirred the social media platform, Twitter highlighting the importance of the new law and the benefits it will provide to acid attack survivors. The law categorizes them under ‘acid attack victims’ who have disfigured due to assault by throwing of acid or any other corrosive substances. The Minister has further elucidated the importance of the law by mentioning about the medical concerns of the victims along with their difficulties. The Act is supposed to be implemented in the mid-April. Even under the new law, reservation for people with disability was increased to 4% (earlier it was 3%).